Turbula - Culture - Book review: "Sinatra: The Voice"
That there even exists a market for a new biography of Frank Sinatra a full 12 years after his death is due entirely to his art. Whatever foibles and weaknesses he may have had as a human being, when you put a microphone in his hands he was one of the greatest popular singers of all time. And yet, a much ballyhooed new biography of Sinatra only hints at the music, and offers almost no new insight into what made Sinatra the iconic singer he was. The book is subtitled "The Voice" (Sinatra's nickname in the press for the first part of his career), but James Kaplan's exploration of the first half of Sinatra's life is much more focused on his personal relationships, the more salacious the better. Yes, the gossipy items Kaplan has chosen to fixate on  much like Kitty Kelly's best-selling 1987 scandal-ography  have dogged Sinatra his entire career and have provided titillation for generations of Americans. But that just takes us back to the first point: Nobody would care about the affairs and the fights and the alleged mob connections if he hadn't mattered in a very real way as an artist. And he mattered because of the music he created, going back to his earliest days with the Harry James Orchestra. Frank Sinatra the musician is mostly missing from these pages, as he has been from most of the biographies written of him  which is a bit perplexing in that he was a man who reportedly corresponded frequently with friends and colleagues, an artist with many collaborators who remain alive and accessible (and who also kept diaries and wrote letters sharing their insights into their own careers, which crossed paths with Sinatra's). Clearly, Sinatra spent a lot of time thinking about music, talking about music  his and others'. By all accounts one of the most painfully self-aware figures in popular culture, it's inconceivable that detailed documentation of Sinatra's own thoughts on his muse don't exist. Kaplan himself notes in his acknowledgements at the end of the book that Sinatra the musician has yet to be fully explored in an of the biographies written to date  and offered that as the very purpose of this book. In that purpose, he fails miserably. Instead of musical insight, we get a rehash of how Sinatra was influenced by Tommy Dorsey, of how he idolized Bing Crosby, of his fascination with black singers and musicians. All of which has been amply documented elsewhere. In terms of Sinatra's own reflection on his music or that of those he worked with, there is almost none. The closest we get is when Kaplan repeatedly offers a superficiality of how Sinatra liked to really tell the story of the lyrics when singing  but no quotes explaining this, or of how Sinatra chose the songs he sang, of how he prepared for a session. The chapters on Sinatra's time in the Dorsey band delve into psychoanalyzing the relationship between the two men (theorizing that Dorsey was a strong father figure for Sinatra, whose own father is portrayed as playing second fiddle to Sinatra's mother in his life). But after-the-fact armchair psychiatry is a poor substitute for a well-researched biography that would use the subject's own words (and the words of those close to him) to help us understand the genius that created some of the most popular and enduringly influential recordings of the 20th century. 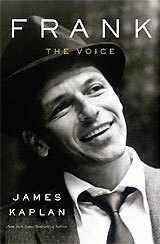 Reading "Frank: The Voice" won't help fans understand Sinatra's artistry any more than before they crack the cover. You'll know more about his tempestuous relationship with Ava Gardner than you may have ever cared to know, though. But as far as understanding and appreciating the music from the period of his life covered in this book, your best bet is still to get the four-disc box set "Best of the Columbia Years (1943-1952)" and simply let the music stand on its own.